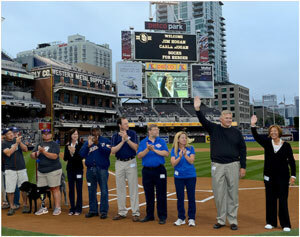 Jim and Carla Hogan (far right) were recently honored by the Padres during a Military Appreciation Night. Jim and Carla Hogan's 20-year-old son made the ultimate sacrifice in Afghanistan nearly four years ago when he put himself between other Marines and danger. Lance Cpl. Donald Hogan was posthumously awarded the Navy Cross for combat bravery; his parents have since dedicated themselves to helping service members in Afghanistan in his memory. Lance Cpl. Hogan was assigned to the 1st Battalion, 5th Marine Regiment. He was on foot patrol in Helmand province on Aug. 26, 2009, when he spotted a trigger wire for a buried bomb. According to the Navy Cross citation, Hogan hurled himself into the body of the nearest Marine to push him away from the explosion and subsequently warned other Marines of the danger. As a result of his actions, Hogan was the only Marine killed that day. After the death of their son, the Hogans, of San Clemente, reached out to members of their son's unit. "When the unit redeployed, we asked them what they needed," Jim Hogan says. He was surprised to hear the Marines' simple request: socks. The Marines explained that they spend all of their time on their feet, have no laundry facilities, wash their socks in canals and hang them to dry. "The military does not issue them," Hogan says. "I told them I would send them socks and I needed to make good on my word. I bought a couple hundred pair from Walmart and sent them off to my kid's old platoon. Then I got a note from another platoon asking, 'Can we get some socks, too, Mr. Hogan?'" 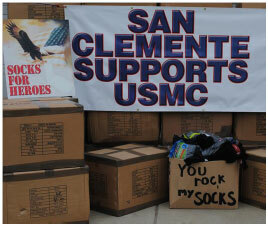 Carla Hogan started a nonprofit, the San Clemente Marine Corps Support Group, to begin fundraising for the sock effort. They named their operation "Socks for Heroes." Jim Hogan would drive up to Los Angeles where he could get crew socks for 50 cents a pair. He once loaded the back of his 1967 Chevy pickup with 36 crates of socks. "It's the closest the truck ever came to becoming a true lowrider," he says. Word of clean socks got out. "We got a request from a mom whose son was serving in 1st Battalion 9th Marines, out of Camp Lejeune, (N.C.)," Hogan says. "Then requests from another unit." With help from Renfro, a sock company in North Carolina; Trump Card, an air freight company; monetary donations from patriotic companies and citizens; and local fundraising events; Socks for Heroes has shipped approximately 203,000 pairs of socks to service members. "That's just shy of 17 tons," Hogan says. "We have been doing it a little over two years now, since May 2011. We are a little local support group with a national presence and we get donations from all over the country." Clean socks are a simple need and basic necessity, Hogan says. But to the Hogans, it's more than that. "Our mission is to raise awareness, send socks and let people know what is going on in the war right now," he says. "We have a Facebook page and weekly blog that people forward all over the world." The Hogans enjoy being around Marines and their families. "We are there for all the Camp Pendleton homecomings and deployments with coffee and food in the middle of the night," Hogan says. "Carla also worked with the city of San Clemente to classify all Marines and sailors stationed at Camp Pendleton as residents of the city so they could take advantage of Department of Recreation opportunities at reduced costs." The memory of their son is always at the forefront of why the Hogans do what they do. The couple adopted Donald when he was 5. Jim Hogan believes his son was destined to be a Marine. "My dad was a Marine," Hogan says. "He was a Marine's Marine and served in three wars. My dad and my son were close and my father encouraged his dream. "He wasn't what you would consider a great student. He went to college for about an hour trying to make us happy and then he joined the Marine Corps." "He loved being a Marine," Hogan says, his voice breaking through his tears. "He loved being in uniform and loved the fact he'd gotten through tough training. My son always looked out for other people because of the fact he'd been an orphan. He did what he thought was right." After Lance Cpl. Donald Hogan selflessly gave his life to help save other soldiers in his unit, his parents have since dedicated themselves to helping service members in his memory. Marine Staff Sgt. Juan Elizondo says he will remember Lance Cpl. Hogan as someone who was always happy. Elizondo was there when Hogan was killed, working as the dog handler as the Marines searched for hidden explosive devices. "Donald sacrificed to make sure things were done," Elizondo says. "He was very motivated and dedicated. What he did saved the lives of eight other Marines. Most of them went home injured but they made it home because of him and his choice." "The Hogans are doing something Donald would have done," Elizondo continues. "They are making sacrifices of their time, time with their family, which is the same thing Donald did. They are continuing his legacy."